"It's blood. Don't break it." It amazes me to consider the types of films that often are immortalized and known by nearly all of the general public. Paulie Shore movies (Encino Man, Biodome), overrated Oscar® winners (Forest Gump, Titanic), and dull action films (too many to name) enter our consciousness through constant replays on network and cable television. This leads numerous quality stories to slip through the cracks and remain lost from most audiences. At Close Range suffers from this syndrome. It stars Christopher Walken, Sean Penn, and a score of other talented actors, yet I had never heard of it before this release. Brad Whitewood, Jr. (Penn) spends his days lounging around and getting involved in minor scuffles with other occupants of the small town. He possesses a strong conscience, but hasn't found anything to believe in or strive towards. This changes when he falls in love with Terry (Mary Stuart Masterson)—a cute young girl with a rebellious streak. Around the same time, Brad Sr. (Walken)—a charming, small-time criminal—begins to take a greater interest in his son's life. While he learns the basic elements of the crime world, Brad Jr. finds an outlet for his restlessness and a way to please his infamous father. Unfortunately, he discovers another side of Brad Sr., and tries to quit the business, with disastrous consequences. The story of a crime family and its problems is not original, but this one contains a level of realism missing from numerous films in the genre. Brad Sr.'s reasons for leaving the house remain unknown, but he's left a permanent stamp on his former wife. She strolls around the house with little life or energy, and spends most of the film in a quiet depression. Brad Jr. commits unlawful deeds, but his character has extra dimensions that make him similar to numerous young men in today's world. His immediate adoration for Terry reveals the amount of love in his heart that differs from his brutal father. But Brad Sr. exists as more than a one-note villain. I totally understood the allure and charm of his character. He flies through life seemingly without any worries, and does have a few ounces of caring for his son. They just fail to outweigh his central concern, his own well-being. Christopher Walken gives possibly the best performance of his career as this cold, volatile criminal. Throughout his career, Walken has excelled in playing over-the-top roles with an excessive amount of energy. Notable examples include his work in True Romance, The Addiction, and Sleepy Hollow. While his performance in this film exudes menace, he holds back and plays it cooler, and that adds to the vicious nature of this character. Brad Sr, kills without a second thought, but everyone knows his reputation, so he can enjoy himself and take it easy. Sean Penn once again showcases his acting talent by giving Brad Jr. realistic responses to nearly every situation. The final father-son confrontation contains a powerful mix of emotion and ferocity. At Close Range also includes early roles from a collection of noteworthy acting talents. Mary Stuart Masterson plays a pivotal part in the film and stands up well with Walken and Penn throughout the film. It's easy to forget how talented she is when given a worthwhile role. This film also contains a very young (and skinny) Chris Penn in the role of Brad Jr.'s brother Tommy, the usually quirky Crispin Glover (Back to the Future), and David Straitharn (Limbo) as an epileptic henchman. None of them receive a large amount of screen time, but each one receives at least on scene to shine and show the promise they would display in the future. Director James Foley (Glengarry Glen Ross) deftly creates a dark, foreboding atmosphere in this film that keeps you interested even when little is happening. While the setting of the story appears somewhat dated, the pace keeps moving and remains exciting and lively. Numerous scenes are worthy of mention, especially the surprisingly docile murder of a low-level snitch. The camera keeps us separated from the action by leaving us on the hill with Brad Jr. overlooking the murder site. The act is sudden and occurs almost without a sound, and this adds to the menace of Brad Sr.'s character. He can kill in a quiet environment with no grand speech or declaration before the deed. The story of this film is based on the story of real-life killer Bruce Johnson, and while it obviously contains some dramatic license, it retains a realistic tone. I believed that teenagers similar to Brad Jr. and Tommy could exist in this world, and uncaring fathers sadly live everywhere. It's nice to watch a film that takes its time to build up into its final crescendo of emotion. Screenwriter Nicholas Kazan (Reversal of Fortune) gives us plenty of time to meet the characters and understand their motives before chaos ensues. When disaster does occur, it contains added relevance because we're now emotionally attached to the people in the story. Image Transfer Review: This two-sided disc offers viewers the option of choosing between a 2.35:1 anamorphic widescreen transfer and a full frame transfer. The widescreen transfer works wonderfully to convey the bleak atmosphere of the film. The black levels are very solid, and the colors are well defined and impressive. I noticed virtually no defects on this excellent transfer, which helps to enhance the power of the film. The darker colors during the depressing final act retain a surprising level of visibility and clarity. This film does shows the signs of its 1985 release, with its naturalistic look and shady colors, but that takes little away from this nearly blemish-free transfer. The full frame transfer doesn't provide the same picture quality or viewing experience. I would only watch it if the black bars of the widescreen version disturb you. Audio Transfer Review: This 2.0-channel Dolby audio transfer for At Close Range stands out as one of the best of its kind. While it fails to match the depth of a true surround experience, a surprising amount of complexity exists in this transfer. At times, birds are chirping from the far right speaker while the characters speak on the other side. The sound moves nearly flawlessly across the two speakers, and this leads to a more nerve-wracking experience. This is especially the case after Brad Sr. starts to cover his tracks in the final act of the film. The atmospheric sound is striking and springs from the high quality of this audio transfer. Extras Review: I'm sensing a pattern with the recent MGM catalog releases. Once again, this disc includes only a theatrical trailer as an extra feature. The trailer comes in the widescreen version, but its transfer is not on the level of the film itself. The onscreen menus do look better than comparable MGM discs, and the 32 chapter stops provide numerous opportunties for viewing the best individual scenes. However, the lack of any significant special features is still a major disappointment for this excellent film. 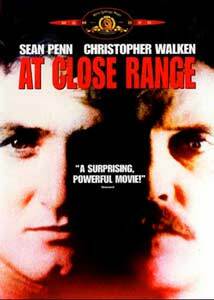 Even without the extras, I highly recommend At Close Range for the wonderful performances from Sean Penn and Christopher Walken. The atmospheric direction and strong supporting cast add to the richness of this film, which hopefully will undergo a revival with the release of this disc.